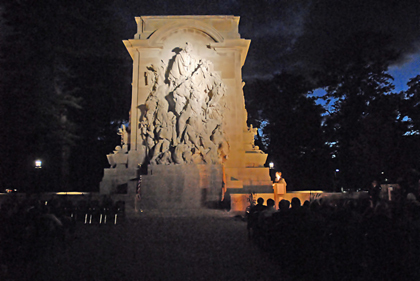 A SPOTLIGHT ON A MAYOR'S LEGACY: Princeton Battle Monument was bathed in light Saturday as a two-year, $150,000 campaign to raise funds to light the once-darkened monolith finally came to a close. The lighting initiative was a campaign goal of the late Princeton Borough Mayor Joseph O'Neill, who, in early 2005, launched an effort to rehabilitate and enhance the 85-year old structure, which was designed by architect Thomas Hastings, with sculpture by Frederick MacMonnies. Mr. O'Neill, who died in October 2005, worked with the state in a monument-cleaning effort that surpassed the half-million dollar mark, and also sought out the not-for-profit Princeton Parks Alliance to spearhead a drive to fund-raise for the monument's lighting. A Princeton Parks Alliance gala event and fund-raiser at Historic Morven followed Saturday's lighting. Less than a year after a Princeton Fire Department chief abruptly left his post citing conflicting time scheduling between his full-time job and the increasing responsibilities of running an all-volunteer department, another chief has left the department, and Princeton Borough is now looking to modify the department’s governance structure. A proposal to relax the senior housing age requirement as outlined in the zoning for a 20-acre expanse along Bunn Drive could lead other developers to amend their applications from the once-required age 62-and-over mandate to a proposed 55-and-up requirement, according to Township officials. Three scheduled days off and two sick days taken after a night out with friends is what Princeton Borough Patrol Officer Sean McNeff is being left to explain after facing intra-departmental disciplinary charges that could end the three-year veteran’s tenure with the Princeton Borough Police Department. When a South Brunswick woman appeared at the University Medical Center at Princeton emergency room last month with a substance that she thought was anthrax, there could have been two initial responses by hospital staff and patients waiting for treatment: chaos or control. Governor Jon S. Corzine visited the Eden Institute Foundation’s Clayton Center in West Windsor last week to sign into law a bipartisan package of seven new bills relating to autism spectrum disorders. The laws boost state support for programs aimed at helping those with autism and Asperger’s syndrome (the developmental disorder featuring autistic-like behaviors). Last fall, the Princeton University football team started its season by digging a 10-0 hole at Lehigh. As the Seton Hall women's soccer team recently kicked off its season, it almost got an extra reinforcement from the sideline. For the past three falls, Hannah Deming has operated in the midfield for the Princeton High girls' soccer team. Bill Strong describes himself as a “serious volunteer.” He certainly fits the description. In the attic workroom of his home on Maple Street he has all the tools needed to repair books from the third floor children’s section of the Princeton Public Library. He’s been honing his book repair skills for the last twenty years, first in Pennsylvania, where he led a volunteer effort and now in Princeton. Also a veteran community activist, Mr. Strong, together with his wife Nancy (the couple just marked their 50th wedding anniversary), jumped at the chance to buy a home on one of Princeton’s tree streets in 2001. Their daughter Laura and her family lives nearby.